International Straight Wire & Orthopedic Seminars inc. I have been in dentistry starting in 1987, for the first 10 years it was mainly general dentistry, after 1997 just Orthodontics. I met Dr. Bernardo H. “Coco” Garcia for the first time in Oostende Belgium, where I attended his basic Orthodontic course. What he learned me there about orthodontics and dentofacial orthopedics was beyond everything. I was so impressed by his treatment methods, protocols and results that I decided to invite him to come to Germany to do his courses and in-office training for my practice. He made my office grow from an average in size orthodontic practice into 2 very large orthodontic practices and 2 fast growing “starting” practices. All this under his faithful supervision. From 1998 until now we treated over 26000 patients with amazing results and almost all without extractions. Dr. Garcia has, over these years, proven to be a real asset to my practices and has helped me, my staff and many patients enormously with his hard work and extreme dedication. I have been taking orthodontic courses for the past 13 years in my career. I have attended many courses. I decided to take Dr. Coco Garcia’s course because I thought it would be nice to attend a course in my hometown. It was the best “chance” choice I have ever made in my career. He is passionate about his teaching. He has so much to teach that you could spend a year with him every day and you would learn something new every day. Most importantly he has an organized approach to his treatment. He focuses strongly on diagnosis and sets his students up to succeed. What I love most about Dr. Garcia’s course is that he supports his students no matter where he is travelling in the world with his teachings, as well as with local tutorial groups. It is an essential course for any general dentist hoping to add thorough orthodontic knowledge to their practice. Prior to taking my first course with Dr. Garcia in 1980's, I never felt comfortable treating orthodontic cases with the courses I attended before from other orthodontists. It was apparent from the first day that Coco's concern was not the money one would make doing orthodontics but the quality of work produced along with the deep satisfaction of correcting nature's wrongs. He impressed upon me the need for proper records and analysis to produce consistent good results. His extraordinary skills at bending wires and knowledge of the cutting edge of orthodontic advancement, coupled with his ability to bring these same authors to his annual symposiums have not only given me the ability to handle complex orthodontic cases but to welcome them. I look forward to Coco's new book and would encourage all to read it. I always felt that Coco had the backs of his study club members and has gone above and beyond what I experienced in other study clubs. He is not only a mentor to his students but also a great friend and for that I sincerely thank him. Dr. Pablo Echarri, DDS has over 25 years of clinical experience in orthodontics and operates a private practice in Barcelona, Spain. He obtained his DDS from the University of Montevideo, Uruguay and is currently the President of the SIAOL, President of the Scientific Committee of Catalonian Dental Association, President of the III World Society of Lingual Orthodontics Congress and a former President of the European Society of Lingual Orthodontics (ESLO). 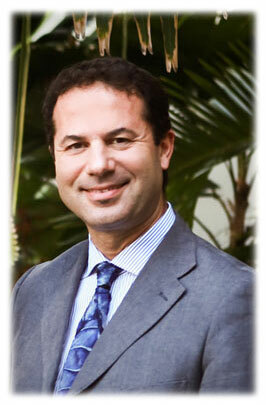 "Dr. Bernardo H Garcia has been involved in many areas of orthodontics for more than 30 years. Dr. Garcia has lectured extensively throughout the world, founded many orthodontic study groups in various countries and also wrote many scientific articles, as well as a text book "Orthodontics and Orthopedics Today" that has helped his student understand better the principles or orthodontic treatments. With all that experience, Dr Garcia also developed an effective system that uses a common sense approach to mechanics and diagnosis in Orthodontics. I would also like to emphasize that Dr. Garcia is a highly hardworking and enthusiastic person, as well as his full time dedication to teaching orthodontics and his enormous experience"
He is highly respected and has done a tremendous job giving a profound education in orthodontics as Dr. McNamara's letter states. He would be a tremendous asset to your school representing you at a very high level with well-known professors to be part of the program. He would be a director and I personally will be his director here in Europe, location to be announced. Thank you for your consideration and I should be happy to supply any further information that you may need by email or phone call." "For many years Dr. Garcia has provided courses in orthodontics for general practitioners and other non-orthodontic specialists. I have been very impressed with the thoroughness of the program and also the quality of the student that he has produced. In Nov 1992 while in Puerto Vallarta I had the opportunity of evaluating the case displays of a number of his long term students. The quality of the treated results was excellent as were the case write-ups. It was obvious that his students had a very sound foundation in orthodontic theory and practice. One of the most difficult challenges in orthodontic education is to provide a quality orthodontic experience outside of a formal two or three year post graduate program in orthodontics. Dr. Garcia has risen to the challenge and has provided his students with a sound orthodontic education over a prolonged period of time." "I have had the chance to teach alongside Dr. Bernardo Coco Garcia for the last 27 years. Coco's passion for Orthodontics has grown with each year and he has learned all types of mechanics, making him the best in orthodontic trouble shooting that I have ever known." Luis Carriere, DDS, MSD is the inventor of the Carriere Self-Ligating Bracket (SLB). He received his DDS from the Univeridad Complutence in Madrid in 1991 and an MSD in Orthodontics and Dentofacial Orthopedics in Adults and Children from the University of Barcelona, School of dentistry, in 1994. It is a pleasure for me to recommend Dr. Garcia-Coffin, who is a well trained clinician and a qualified professional, as well as an excellent person"
Dr. Grummons has authored a textbook, chapters and articles regarding non-extraction innovations, 3D frontal analysis for crooked faces, TMJ/TMD, smile and facial esthetics. Lectured for 30 years in all major orthodontic societies, 23 orthodontic departments and meetings – 43 U.S. States and many foreign countries (no other orthodontist in this area can say the same). "Few orthodontic colleagues are gifted clinicians as well as being effective teachers. Dr. Garcia shows clinical strengths with his differential approaches, clinical techniques, and smile outcomes." "He teaches with clarity and mentors effectively to those fortunate enough to participate in his courses. Individuals who attend will gain fresh perspectives and new knowledge from this master clinician." "I have been practicing General Dentistry for over 25 years. I have always had an interest in Orthodontics, and thus, have taken numerous orthodontic continuing education courses over that time. I took my first orthodontic course with Dr. Garcia almost 20 years ago and have been a member of one of his study clubs ever since. Coco, as he is known to his colleagues, emphasizes right from the onset, that diagnosis is essential to a successful treatment plan and outcome. His seminar presentations provide the foundation to achieve these goals. In the study clubs, cases are presented for discussion and he offers his opinion on diagnosis, treatment planning and trouble shooting. Coco's commitment to his students is to be commended as he makes himself available for consultation whenever feasible. All my orthodontic knowledge is attributed to Dr. Garcia, and for that I am extremely grateful. As he says, ' There are no shortcuts in orthodontics `." Dr. Tiziano Baccetti was born in Florence, Italy. He received a Ph.D. degree in Dental Sciences in 1996 from the University of Florence. He was the Research Professor at the University of Florence and "Thomas M. Graber Visiting Scholar," Department of Dentistry at the University of Michigan, Ann Arbor. "Dr Garcia is an outstanding orthodontist who is extremely proficient in a wide variety of orthodontic techniques, thus including removable, functional and fixed appliances for the therapy of malocclusions and craniofacial disharmonies. His eclectic personality lead him to become an excellent presenters and a very appreciated clinical instructor. Dr Garcia has an extensive knowledge with regard to craniofacial growth, orthodontic diagnosis and treatment planning, different treatment approaches, patients' collaboration and motivation, and technical aspects related to orthodontics and dentofacial orthopedics. Dr Garcia collaborates since many years with outstanding personalities in the field of orthodontic research and with various Universities, including the University of Michigan, USA, and the University of Florence, Italy. He is a brilliant individual, who shows passion and profound attachment to orthodontics, with a continuous pursuit for knowledge, improvement, and commitment, and the final goal of sharing his expertise with peers." It is with deep sadness that I share news of loss, of a dear colleague and friend, Dr. Tiziano Baccetti. He graced us with a lifetime, although short, with his dynamic personality and intelligence, and his nature to give. Dr. Baccetti and I have known each other for over ten years. During the last five years we became very close friends. His professional talents and research on cases in which we collaborated, supported the functional work that we do, with proof how functional appliances work, helping me to refine my Class III protocols which help practitioners all over the world. As Research Professor at the University of Florence, Italy and Department of Orthodontics and Pediatric Dentistry, University of Michigan, Dr. Tiziano has continued to give of himself in our field of functional orthodontics. His friendship and interest changed my career. Just when I was feeling tired of teaching; he inspired me to continue. I will continue to follow his research, and pass it onto my students, in loving memory of a super friend. When we experience the unexpected loss of a beloved friend, it teaches us never to take life for granted. Although death is a mystery we can’t understand, I as a Christian believe that only God knows the answer. We can grieve and mourn as those who have shared his gifts, and come closer together.